Goergen Institute for Data Science welcomes distinguished speaker and alumnus, Bruce Schneier '84. ABSTRACT: Computer security is no longer about data; it's about life and property. This change makes an enormous difference, and will shake up our industry in many ways. First, data authentication and integrity will become more important than confidentiality. And second, our largely regulation-free Internet will become a thing of the past. Soon we will no longer have a choice between government regulation and no government regulation. Our choice will be between smart government regulation and stupid government regulation. Given this future, it's vital that we look back at what we've learned from past attempts to secure these systems, and forward at what technologies, laws, regulations, economic incentives, and social norms we need to secure them in the future. BIO: Bruce Schneier is an internationally renowned security technologist, called a security guru by the Economist. He is the author of 14 books -- including the New York Times best-seller Data and Goliath: The Hidden Battles to Collect Your Data and Control Your World -- as well as hundreds of articles, essays, and academic papers. His influential newsletter Crypto-Gram and blog Schneier on Security are read by over 250,000 people. 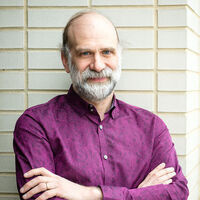 Schneier is a fellow at the Berkman Klein Center for Internet and Society at Harvard University; a Lecturer in Public Policy at the Harvard Kennedy School; a board member of the Electronic Frontier Foundation, AccessNow, and the Tor Project; and an advisory board member of EPIC and VerifiedVoting.org. He is also a special advisor to IBM Security and the Chief Technology Officer of IBM Resilient. He was a good speaker and provided a nice skeptical vision of the future of computer security. One unstated message in his talk was that embedding networked computers in all consumer electronics and household devices is a fait accompli. It's happening and no one can do anything about it. I found this to be an odd point of view, since it seems clear that a large fraction of the buying public prefers "dumb" devices. This implies that the move toward networking is driven by marketing hype (and the need for manufacturers to push these products). If his solution into the security problem is government intervention, why not just ban networked electronics?